The St. Vincent and the Grenadines Co-operative Credit Union is helping members to upgrade. Last Monday, the SVGTCCU handed over $35,000 to 27 Teachers. The money is to assist those engaged in different forms of studies. Remarks came from manger Julian Jack, President Curtis King, as well as Chairman of the Education Committee Dwight Lewis. In order for Teachers to get the money, they have to complete one year of studies. The money is for Teachers studying locally as well as abroad. Teachers are studying for bachelors of education degrees here while those overseas are pursuing areas of management as well as individual subject disciplines. Alma Haynes, another recipient, similarly expressed her thanks. She noted the value of the support in that it helped her to pay for her studies. 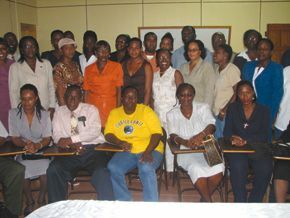 The SVGTCCU also provides scholarships to members’ children who have passed the Common Entrance, book vouchers and school bags to others, as well as scholarships to persons at Community College. The SVGTCCU has close to 6,000 members and assets worth about $48 million.